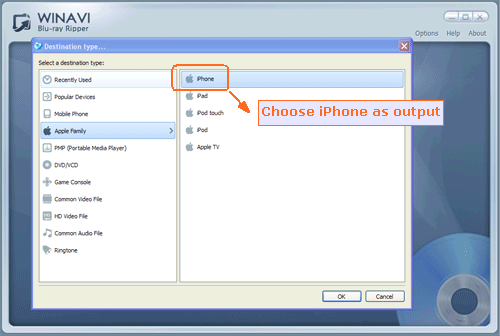 If you want to rip Bluray to iPhone and make your favourite movies can be also played on iPhone, using a WinAVI Blu-ray Ripper is a very simple way to rip your Bluray movies to iPhone directly even though you don't know any video format knowledge. 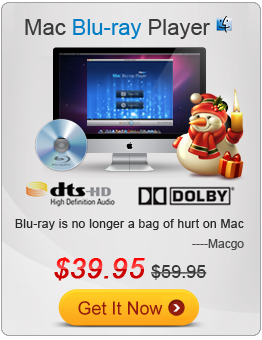 Please follow this article and learn how to rip Bluray to iPhone. 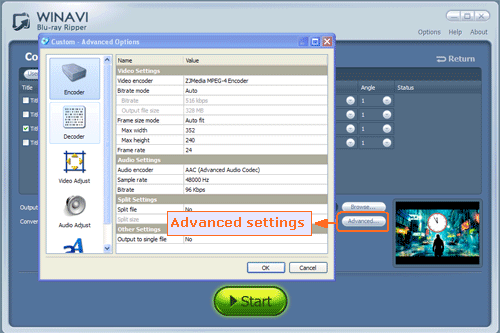 Step 3: After the disc is inserted, you can click "Convert from Blu-ray Drive ", then the program will import all the Bluray titles. Also you can click "Convert from Blu-ray directory" or "Convert from Blu-ray Image File" button to load BD file. Then a small window will pop up and ask you to select the output format, here we choose "iPhone". Step 4: Click "Advanced " option to customize your video of output on iPhone. Step 5: Click "Start" button and start ripping to iPhone. You can click "Open the output directory" to check the converted file after Bluray to iPhone conversion is finished.